No matter how much I feel like I am already quite versed on what's new going on in K-beauty game, I was never right. It's like there is an infinite number of brands, products and new interesting trends that are waiting for me to discover. Now, don't get me wrong, I totally love that because that means that there will never be a boring moment when it comes to K-beauty! Discovering new products is one of the best things that I enjoy to do as a so-called 'beauty blogger'. Yes, I am guilt tripping myself for the lack of reviews here LOL. Anyway, let's talk about my latest find which is the reason I am writing today. The brand Jayeon 자연, which literally translate to 'nature' in Korean was introduced to me pretty recently. I was asked if I would be interested to be trying and reviewing their sheet masks range, so of course, I said yes. When the package arrived last week, the brand has nicely included in two extra products for me to try out; a cleanser and my must-have item, a tub of aloe vera gel. Yes, seriously, there is no such thing as too many aloe vera gels. 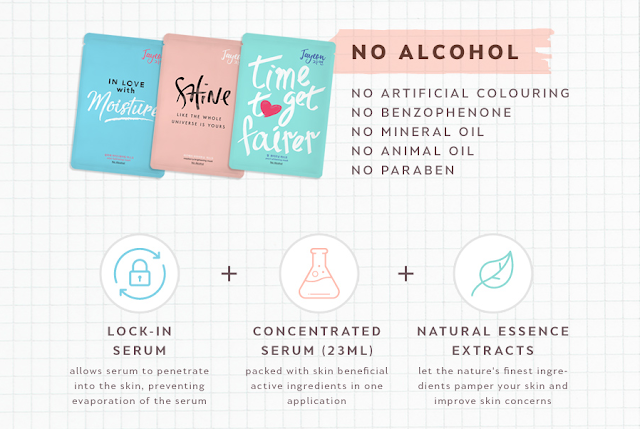 According to their website, the brand Jayeon focuses on 'providing natural skincare from Korea and it recognises every consumers' struggle for good and affordable products'. Offering formulations made in Korea that are suitable for all skin types, it also comes with 6 'NO' assurance when it comes to the ingredients inside of their products which includes No Paraben, No Alcohol, No Benzophenone, No Artifical Colouring, No Animal Oil and No Mineral Oil. This is definitely a good thing for those who are very conscious about what goes into their beauty products and on top of that is also a good thing for Muslim consumers who tend to avoid alcohol and animal oil in their cosmetics. The Jayeon masks come in three different variety with one similarity that I absolutely love. Each of them contains aloe vera which is by far one of my favourite ingredients to have inside my sheet mask because they work not just to hydrate, but also to soothe and help my skin in time when it's breaking out. The first type is the Jayeon's 'In Love with Moisture' Aloe Hydrating Mask and this mask is definitely my favourite out of the three. It's really hydrating, comes with a lot of essences inside and is not sticky at all. My skin feels amazing after putting it on. I also love the scent of this mask the most! I am not sure how to describe it other than it has that scent you can usually smell in organic products. The Jayeon's 'Like the Whole Universe is Yours' Raspberry Brightening Mask has a more fragrance-like scent but just like the hydrating type, it is not sticky to the skin. It also contains the Cheese Fruit (known locally as Noni), which is a quite an interesting ingredient to have. I don't remember ever encountering any product with the same ingredient (that I've noticed of). This mask also does give my skin that light natural glow just like it claims. 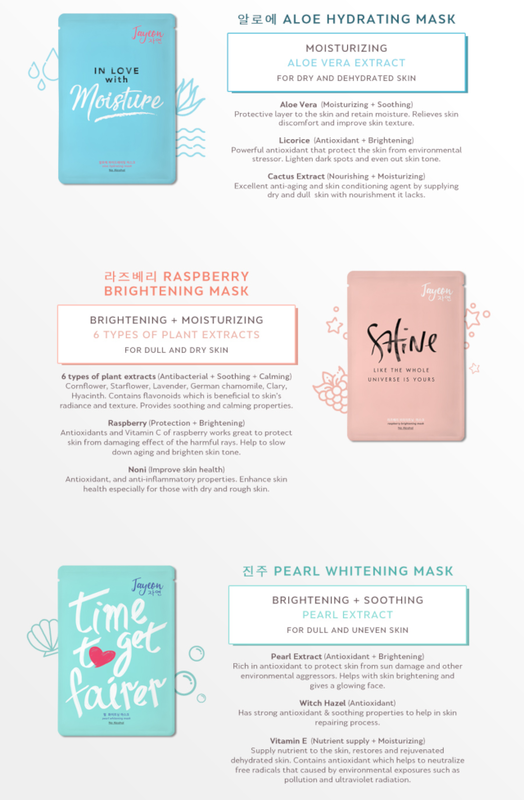 Unfortunately, my skin doesn't react well with the third type which is the Jayeon's 'Time to Get Fairer' Pearl Whitening Mask. It's slightly itchy on me but I was already expecting this because based on my previous experiences, my skin generally doesn't really react well to two type of beauty products; one with whitening properties and the other one is with a product that has a strong citrus ingredient. It also leaves a slightly stickier residue on my face compared to the other two. So, if you have a pretty sensitive skin like me and tend to react with whitening type product, I would suggest you get the Aloe Vera Hydrating Mask because that one is absolutely worth it for the price and I am planning to repurchase again soon! Plus, with the ongoing Buy 2 Free 1 promotion, you can get at such a deal (RM2/mask). Do read the last paragraph of this post for more info on the promo! 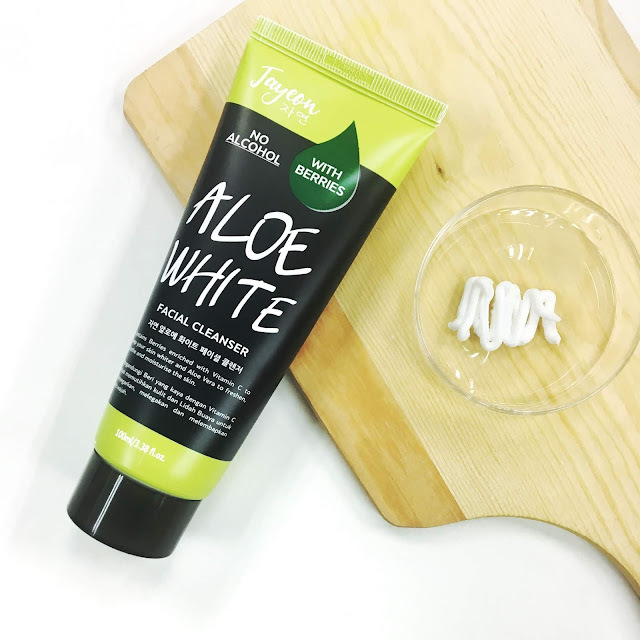 Despite what I said about how products with whitening properties tend to irritate my skin, I was pleasantly surprised to find that this doesn't apply to Jayeon's Aloe White Facial Cleanser (100ml). Containing berries (whitening) and aloe very (soothing and hydrating) as the main ingredient, I find this cleanser gentle on my skin, and doesn't not cause my skin to be overly dry after cleansing. It has a light and pleasant fruity scent which I don't mind as well. For just RM14.90 (current promo: RM13.86), I think it is a very affordable cleanser too and worth to try out! 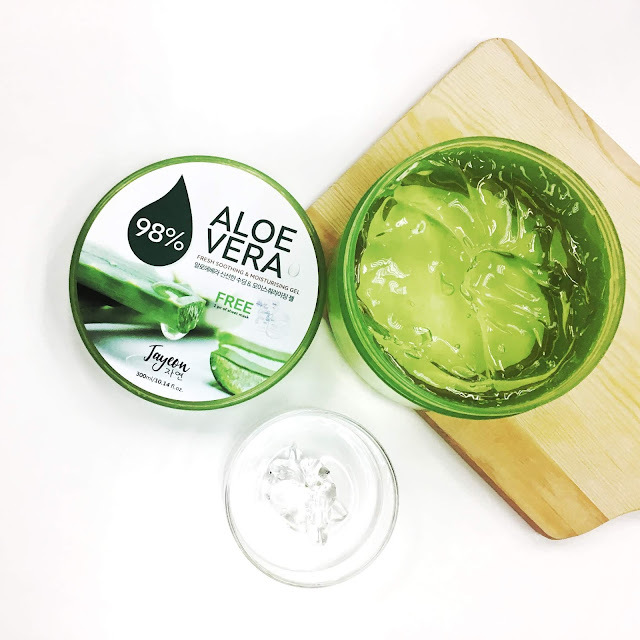 I've said this many times, aloe vera gel is one of the most versatile beauty product that actually works just like how they say they do. I also like how fuss-free they are and how most of them contain a minimal number of ingredients other than the aloe vera itself. 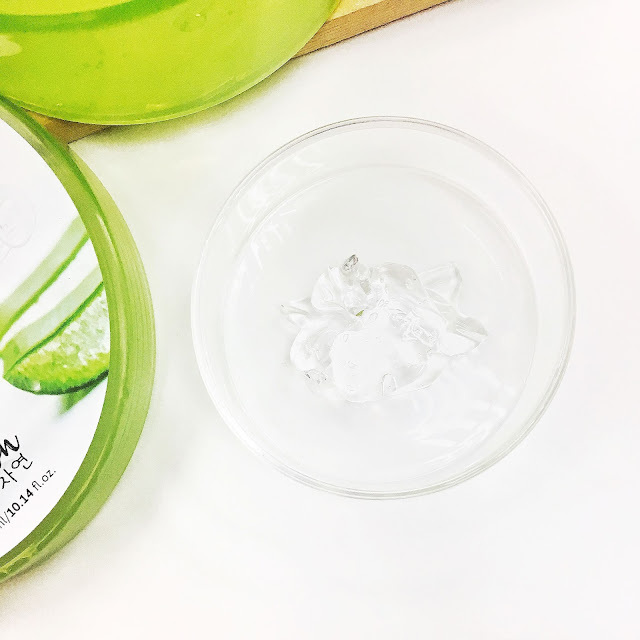 I also love the refreshing and light scent of aloe vera gel. This Jayeon Aloe Vera Fresh Soothing & Moisturising Gel also is non sticky and get absorbed pretty quickly as well. 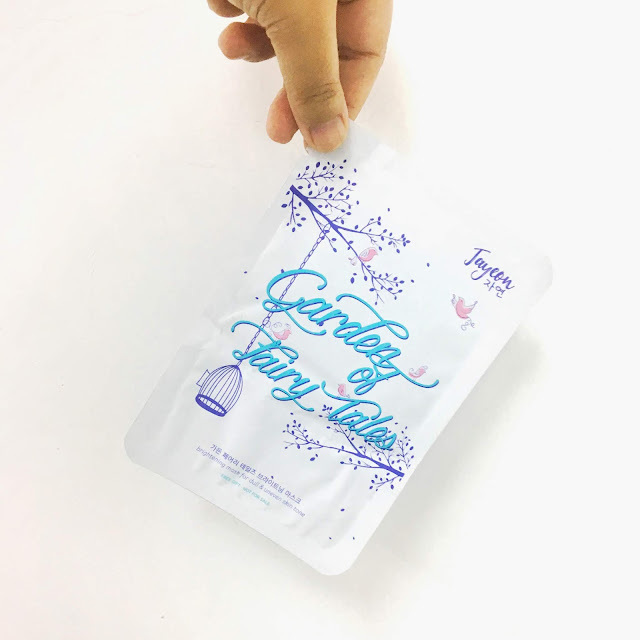 Comes in a 300ml tub (RM18.90), it contains 98% aloe vera and comes with a free Jayeon Garden of Fairy Tales Brightening Mask. 300ml tub is too big for you? Believe me, it's not but if you prefer something in a smaller size or prefer something you can travel easily with, you can purchase the 100ml tube version of it for only RM12.90. Free mask that comes with the 300ml tube of aloe gel! 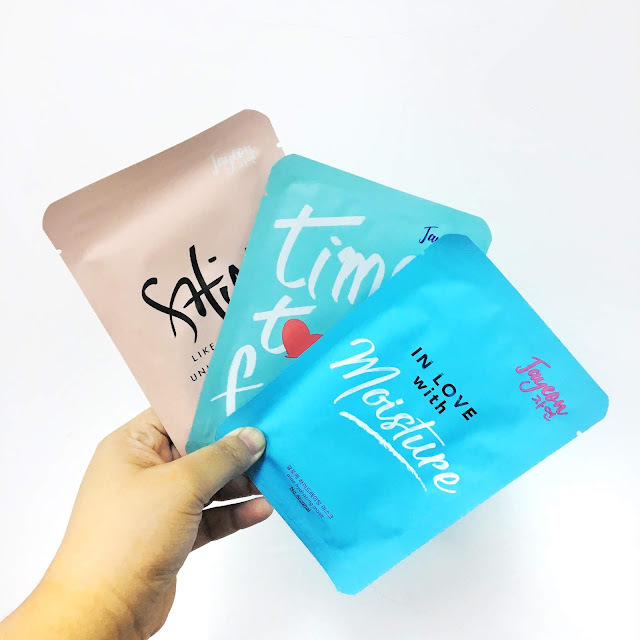 All of these products are currently available on www.11street.my at the Beauty Asia Official Store and speaking of it, they are currently doing a Buy 2 Free 1 promotion for the three sheet masks where you can get 3 boxes of them for the price of 2 boxes which is for only RM33.80. This is super worth it since each box contains 5 pieces of masks (which means you'll get 15 pieces in total) and you will only be paying about RM2.25 for each of them! And oh, you can also save more if your total purchase is valued above RM30 by using the RM5 voucher code available for download from 1st June to 31st July 2018 on the Beauty Asia Official Store. You know what? The mask hoarder in me is really tempted to get myself more! Other Jayeon products like the cleanser and the aloe vera gel are also available for purchase there and I notice they are currently discounted at a lower price too. For further information, you can also check out on this brand further by visiting their website on jayeoncosmetics.com or visit their Facebook page on Jayeon Cosmetics. Disclaimer: this is a sponsored post but please be rest assured that the opinions on the products shared above are solely mine and are definitely unbiased.